What one MUST BUY from Sarojini Nagar Market, Delhi !! | The Shopaholic Diaries - Indian Fashion, Shopping and Lifestyle Blog ! What one MUST BUY from Sarojini Nagar Market, Delhi !! How are you all doing? Enjoying the crazy hot weather?? :D Lol silly me, how can one enjoy such a hot weather.. I do hope god listens to me soon, anyways getting back to the post- many of the readers have requested me to share my latest Haul post from Sarojini Nagar Market, Delhi! And well as we girls love flea markets so much, I thought of sharing an interesting post about What one MUST BUY from Sarojini Nagar Market !! If you are a Delhiite, I am sure you must have visited this market or else atleast must have heard your friends boasting about their cool finds from Sarojini at throw away prices. 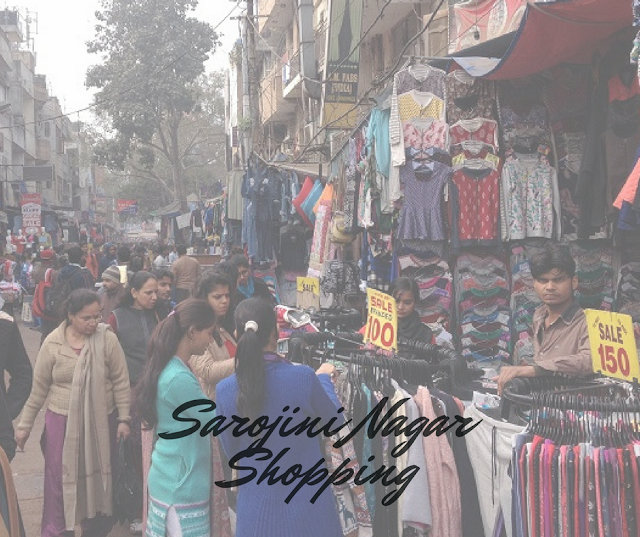 Well you can get the trendy clothes from Sarojini Nagar too, if you read on to know what you must buy the next time you visit SN market. Florals - This trend can never go out of fashion, and SN proves it too with floral dresses, shirts, tops, skirts etc. available in the market every season, every time and almost at every shop. So if you love this cute trend too, make it sure that you check out the floral collection there. Latest Trends - Polkas, Peter Pan collars, leopard prints, lace, sequins or cut-out shoulders, I believe latest trends come to this market even before they reach the fashion labels at major malls in India. So if you want to own the latest runway trends at throw away prices, make sure to search for them at our very own SN. Day dresses - Going for a vacation, casual day out with friends or a lunch date, and unsure about what to wear? 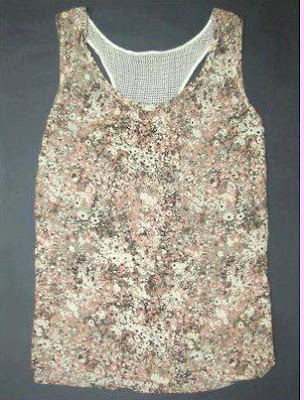 Well cute day dresses in cotton and chiffon are a must buy and you'll get them from SN in not more than 200-250 bucks. You can try out short, knee-length and maxi dresses in various patterns which are available at most of the shops. Shorts / Skirts - Though finding your waist size might be an issue, but if you know how to get your fit from flea markets, SN has huge options for you. From leopard prints to polka dots, the market has even skirts and shorts in elastic pattern for those who don't want to risk buying a smaller or bigger waist. Wardrobe basics - Shrugs, vests, camisoles, stockings - you name the color and they have it. I find it stupid to spend thousands on these wardrobe basics which I know I'll be using often and thus replacing them every season. So I find it better to buy them from SN in different colors to mix and match. Accessories / Sling Bags - This market has a huge range of accessories like jewelry, scarves, hair pins and awesome sling bags and clutches which are available at reasonable prices so that you can buy as many as you want to mix and match with your outfits. And well a very IMPORTANT TIP- Carry not more than 1000 - 1500 INR ( around 30$) in your wallet, or else trust me you'll end up spending every penny ! You can have a look at my previous posts HERE and HERE on Sarojini Nagar Market, Delhi. I am planning a trip to SN today only !! This post is so informative, I feel like going out and shopping now :) I hadn't been to this market before when I visited Delhi. now I wish I had. Some really fabulous buys! Absolutely love what you have choosen! Wish we lived in Delhi to lay our hands on those awesome pieces! Omg, you found such lovely pieces! we just went to Delhi, and visited sarojini for the 1st time. It was heaven! we got such cheap bargains! such amazing clothes! We just got u through IFB. You have a great blog! lovely tops there and happy shopping! Thanks for stopping by hon !! :) Would love to follow your blog. Great picks!! I loved going to SN market with friends while in college..miss those good old days! Hope you are having a wonderful day! PS. New post is up, come check out my blog whenever you have a chance! I love your blog, a new follower! Yes we're from Chd, where r u from, in punjab? looking fwd to more posts from u! hahah good tip on the secret stash cash to use for emergencies! I could use this on Liking Road or Hill Road in mumbai! Thanks for visiting ym blog. following you now...see you on my blog! I have been to Sarojini Nagar Market in Delhi many a times and it is quite popular market of Delhi and most of the Delhites like to visit this place usually. As I have seen and observed there are lots of varieties of clothing in this market, here one can get new and old clothes. In new clothing this market is best for purchasing kurtis like simple kurtis, cotton kurtis, or latest designer kurtis at a good price. After this ladies tops, tunics, jeans for ladies & boys, belts, ladies fashion accessories, mini skirts, tight, stockings, leggings, stoles, jackets, shirts, sandles, heels, nighties, lingerie, latest designer salwar kameez are some of the other outfits which this market is popular for. So it is better to buy these stuffs from this market. In used stuffs one can get old jackets, shirts, t shirts, lowers, shorts, skirts, etc. at very cheap price something in the range of Rs 50 to Rs 250. It seems to a brilliant piece of information. it is very lovely dress and nice post. Sarojini Nagar Market is one of the oldest and most famous market of not only Delhi but whole Delhi NCR region. People from Delhi and adjoining areas love to visit this market for various shopping needs. I have also been to this market many a times as I live in Delhi itself. Sarojini Nagar market is famous for ladies kurtis, fashion accessories, artificial jewelry, imitation jewelry, designer sarees, jeans, top, tunics, footwear and homewares, etc. Price is also reasonable here compared to the swanky malls and other markets. last friday we went to SNJ, really amazing collections of kurthis there.my daughter grabbed many tops.price is affordable. your blog so informative.. I am impressed by your description.. I have planned my visit to SM tomorrow..
All designs are very impressive. I really like your post. I like the way you written the post. There are many website who famous for fashion blogs and fashion articles. Thanks for sharing such a nice post.. Awesome collection of designer sarees. I love it. This is the Best sarees stores in Delhi. Beautiful dress, thanks for sharing. Kalazone is one of the best Saree Showrooms in Delhi. You can also buy online sarees in Delhi. Designers salwar kameez in Delhi is most well-known. Wow..Such a beautiful collection.A unique webstore for indian outfits, we provide an exclusive range of indian cultural clothing starting from Latest designer lehenga, salwar kameez, designer sarees, indo-western use. Nice collection!!!!!!! Salwar Kameez Style Selection 2014 now available online. New designs of salwar kameez Styles at inexpensive cost at Salwar Kameez Sale in Kalazone. Nice collection..College students prefer shopping online salwar kameez since it reduces the efforts of visiting shops. They prefer Salwar kameez online shop. wow its really wonderful sarees. you have good thought about sarees. I am new but i like to buy bollywood sarees for good appearance. thanks for sharing with me. I like that scarf, after see your post I am highly welling to visit Sarojini Nagar market to purchase scarf specially. Also want to buy designer sarees so is there any saree store you know nearly located to Sarojini Nagar market. I like your idea here everyone is attracting towards online shopping but there are shops also available with amazing wears. I also wanted to buy long kurti online I am sure I will find there a very nice collection but I think I should also try shops. I have listen about Sarojini Nagar market even whilE living in Panjab. And after reading this article I have become more eager to do shopping in this market mostly for casual kurti. that's a lovely post on SN. i even say if you don't shop from SN,you are definitely not a delhi girl. collection here is superb and at unbelievable price...delhi is too cool, so its places. places to visit in new delhi is a prelly long list. Whenever I read informative blog I always appreciate the blog author because they think about others from where can we get best quality women clothes, thanks for sharing these with us and I like all the women accessories but one thing plz mention the price of these women accessories. Beautiful designs and styles clothes here. I also designs Sarees and salwar suits in Surat India. Nice post, BolteRaho is one of the leading content sharing and publishing websites in India. Great post you are shared i really like your post doing good job. Thanks for writing about one of most famous markets in Delhi. APert from Sarojini, there are plenty of other street markets available in Delhi. Such as, Click here to know more about Chor Bazaar. Great idea about Kurti Top, Now its sure that, you have became the true shopaholic.